Results: NMB received a call at approximately 1:30am Ontario time. It was from a customer looking for rig mats for a train derailment in Fort Frances, Ontario. NMB responded by having the requested matting on the road immediately. The next morning the customer called and it was determined they needed 1600m of access. NMB had equipment and personnel to site within 12 hours and hauled 3,000 mats to site in less then 3 days. The grounds were extremely soft and uneven, the D8 cats and 25 ton rock trucks that were being used were getting stuck. The access went from the highway to where the derailment took place, the work area had to be 3-5 mats deep and 4 mats wide to allow access to clean up and salvage. 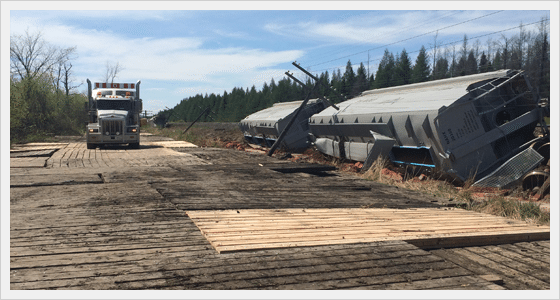 This project went on for over a month, the customer would have spent a longer time trying to get into the derailment if it wasn't for NMB mats and services.